One of the most useful analysis tools is the ability to rectify the images collected by the Argus coastal imaging system. Rectifying and image means to digitally process the image so that it appears that it was taken from the perspective of an aeroplane flying directly overhead the coast, rather than at an oblique angle looking along the coast. This is important if quantitative measurements need to be made of coastal features such as the width of the beach, or the size and location of sand bars in the surf zone or at the mouth of a river entrance. 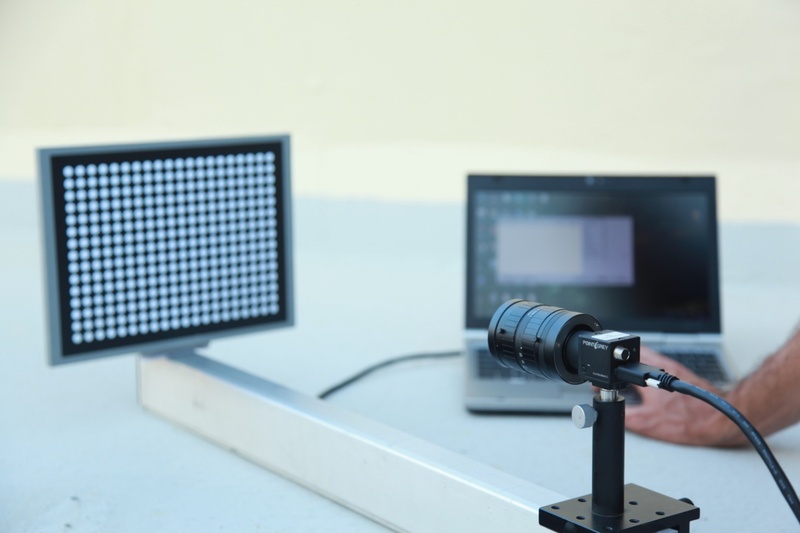 Prior to field deployment, camera calibration is conducted to account for lens distortion when conducting image analysis. One way to conduct this calibration is by processing the camera distortions when viewing a test pattern on a specially designed frame, as demonstrated below. Image distortion coefficients are stored in the coastal imaging database and the distortion is taken into account when conducting image processing. 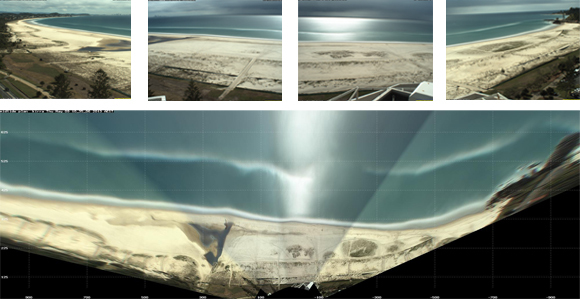 If more than one camera is installed at an Argus site, then another useful analysis technique is the ability to merge and rectify the images from multiple cameras to create a single 180 degree view of the coastline. Once images are rectified, they can then be used to identify and quantify many coastal features and processes. A range of sophisticated image analysis tools are used to produce the results and analyses that are contained in these web pages, including those to calculate beach width. Images can also be collated with wave information to create animations such as the one below, that displays changes at Froggies Beach between February and August 2013.